Grass sod used in Florida is always a warm-season grass variety, which enjoy the mild winters and hotter summers of the state. Not all warm-season grasses grow well in Florida, however, mostly due to the salt in the coastal areas and extreme heat in Southern Florida. Certain types of grass sod are most appropriate for Florida lawns, including bahia, St. Augustine and Zoysia grasses, among a few others. St. Augustine grass is a common sod grass type in Florida, due to its salt tolerance and adaptability for shady lawn areas. St. Augustine sod produces a coarse-textured, dense, dark-green lawn in damp, rich soils. Enjoying the hot and humid Florida climate, this grass does need some watering or irrigation during droughts or dry spells. Popular varieties of St. Augustine grass include Seville, Floratam, Floratine, Floralawn, Raleigh and Jade. St. Augustine sod is most common in South Florida lawns. The Pensacola variety of bahiagrass is grown throughout Florida in low-maintenance lawns. This bahiagrass sod is the most drought-tolerant of all Florida sod grasses. Pensacola bahiagrass has narrow blades and deep, extensive root systems. This sod is also the most cold-tolerant of Florida grasses, withstanding mild frosts that may occur in Northern Florida areas. Argentine bahiagrass sod is also an extremely popular lawn sod in Florida, with wide grass blades and good drought tolerance. This type of sod grass needs more frequent mowing than other types, however. Argentine bahiagrass sod creates a dark-green, lush lawn, but it isn’t as cold-tolerant as some other Florida sod grasses. Bermuda grass sod is more commonly found in Northern Florida, usually established on heavier soils. This sod is most often used for athletic fields, golf courses and other non-residential areas. Bermuda grass withstands some drought and higher foot traffic, but it cannot tolerate shade. Also found in Northern Florida, usually north of Ocala, is centipede grass sod. 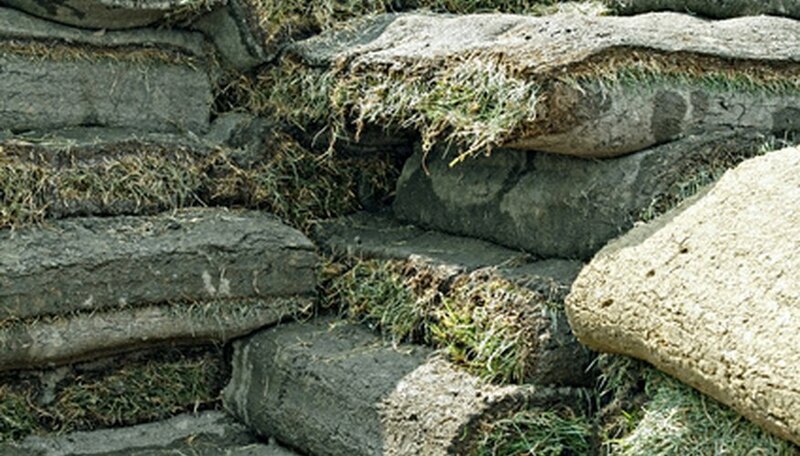 This sod is used to create low-maintenance residential lawns. Centipede grass has a medium texture and some shade tolerance, but it often suffers cold damage when temperatures drop below 15 degrees Fahrenheit. Zoysia grass sod is less-frequently used in Florida, but still can be found in some Northern Florida lawns. Zoysia sod can tolerate some shade, cold and foot traffic. Carpet grass, however, is used throughout Florida but in low-maintenance and usually non-residential areas. Carpet grass sod is coarse and grows best in infertile, wet soils that are rather acidic.